TDL Ruha Latin is a modern and mechanical serif typeface and it results from the development of the RUHA stencil. Contains triangular serifs (in a latin style), vertical stress and maintains the high contrast between the thick and thin strokes, characteristic of the RUHA family. 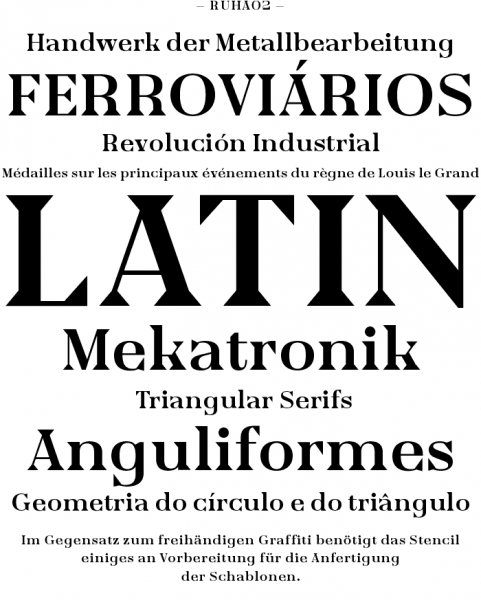 The strongest historical connection is the Roman du Roi, as a developing of a French cut with this modern letterforms and proportions. Ruha 01 typeface was designed from this concept and experimentation with stencils maintaining the same structure with different typographical and stylistic properties. The main typographic proportion are connected with the modern typefaces, like Didot or Bodoni where the letterforms are inspired from the point nib pen design approach maintaining the previous structure of the stencil and modulate letterforms. TDL Ruha Latin maintains the same structure as TDL Ruha Hairline, having been added a strong stylistic feature recognisable from the triangular latin serifs.